Have I been living under a rock, or something? Have you heard of the MLE? I kind of pride myself on being a bit of a televised sports junkie. Watching the National Football league would be my favourite past time, followed by the NBA, some Major League Baseball, a little golf at the PGA level, I watched quite a bit of World Cup Soccer in the last couple of weeks and of course tennis - Wimbledon was full of surprises this year. I'll watch some NASCAR if there's nothing else on. Heck, last weekend I watched the Tour de France. When things get really slow on the multi-channel universe, I know I've hit bottom when something like darts, snooker or poker holds my interest. But I've come across a new, uh, sport. And I use the word advisedly. What pray tell is the MLE? Why it stands for Major League Eating! I'm not kidding. 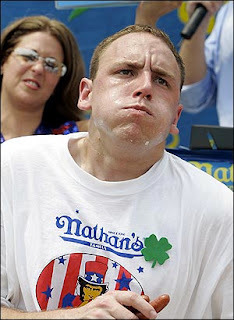 I found out about it when I started reading an article about the Japanese guy who, having said he wouldn't compete in this year's Coney Island hot dog-eating contest, jumped up on the stage and was promptly arrested. Yeah, I know, what does this say about ME, trolling the interwebs for goofy tales of the wild and unimaginable. Any way, turns out this guy, 30 year-old Japanese "eating champion" Takeru Kobayashi, wouldn't participate because the governing body - yep, the MLE - wanted Mr. K to sign an agreement of exclusivity whereby he'd participate only at MLE events. Mr. K refused. C'mon Mr. K. Just how much can you eat? Now I checked out these guys' website. 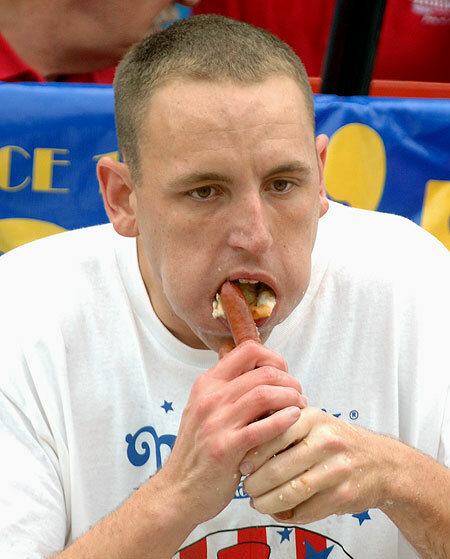 There are record holders in Major League Eating for virtually every food known to man...and some unknown to me. 47 slices of pizza in 10 minutes. 8.31 pounds of vienna sausage in 10 minutes. 6 pounds of baked beans in - get this - one minute and 48 seconds. I don't think I want to be around after that one! And the list goes on: birthday cake, blueberry pie, buffalo wings, chili cheese fries, cow brains, fruit cake, garlicky greens, hamburgers, pickled jalapeno peppers (275 in 10 minutes), pigs feet and knuckles...and the list goes on and on. I had to laugh. One of the sponsors on the MLE website is Pepto Bismol. I don't think any amount of that is gonna help these guys. How do you train for such a thing? What kind of work-out to you go through? If it involves practicing eating don't you kinda screw yourself? If you've spent months filling your face, do you really want to jam down 275 more jalapeno peppers? Um, no thanks, you go first. And you've gotta love that some of these guys have knicknames. 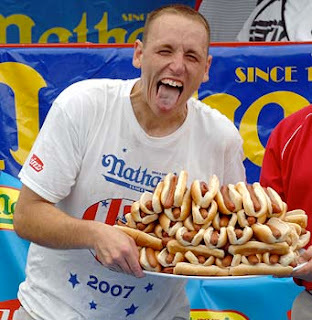 Like the guy who won this year's Coney Island delicious hot dog delerium: Joey "Jaws" Chestnut won by wolfing down 54 dogs in ten minutes. At the 45 second mark he'd already eaten 9. Man, I wonder what made him tail off? Jaws said he was disappointed with his finish. He wanted to set a record of 70. Last year, he beat previous champ Mr. K by eating 68. Well, Joey, you'll just have to train harder...if you don't explode first! ...and, um, after - don't stand too close! If you're interested, and why wouldn't you be, here's the Major League Eating website. I'm surprised these people aren't as big as sumo wrestlers. Or do they practice the bolemic hurl afterwords? 00dozo: Yeah the winner downed 54 dogs, I think. But he was disappointed with his performance. He must have had a "small" snack of 40 bags of pretzels or something. Didn't his mom ever tell him not to spoil his dinner? I was gagging until I read the jalapeno popper (pun intended). Now THAT'S a contest I would consider vying for. And "...darts, snooker, or poker.."
Have you been watching Jersey Shore starring Snooki aka Snicker or Snooker? Quirks: I like jalapenos too, but in moderation (you know, Moderation, California?). If you enter this contest let me know. I wanna take pictures. I know what Jersey Shore is and who Snooki is because some guy punched her to increase the show's ratings, right? Although it didn't get me to watch it. Snooker is a form of pool, played with red balls (don't go there) as opposed to billiards which is played with numbered balls. The latter is where we get the expression "behind the eight ball". Feel free to use any of this information as you best see fit. Providing, that is, that you are fit. I don't know where the expression "fit as a fiddle" comes from but I'm working on it. Are there any psychological research done on these people? I mean, what makes them do this? Surely it is not having that sort of accomplishment/title on the CV, right? Right? RA: ha, ha actually my TT was the previous post, but I'm glad you enjoyed this one. I think these folks are slightly unbalanced. I'm with you. What does a hot dog eating trophy prepare you for in life? These guys must have been losers at all other sports they tried. Seriously, why in hell would they have to resort to crap like that to feed their egos? I just re-read your post and overlooked that "Jaws" isn't really a good nickname for a guy whose last name is 'Chestnut' and eats hot dogs. Ha! Well, it would be more appropriate ... the guy is definitely a wiener. I don't know if MLE is a traveling circus or not, but if it does tour, one stop is always in the nearby city of brotherly love. But Kobayashi's a household name here. Or, at the very least, "That Japanese dude who eats a literal crap-ton of ballpark franks." Jeremy: Oh, they sponsor events all over for all kinds of food. It's a fascinating spectator sport. I just down know how anyone is able to down, as you put it, a "crap ton" of eats.